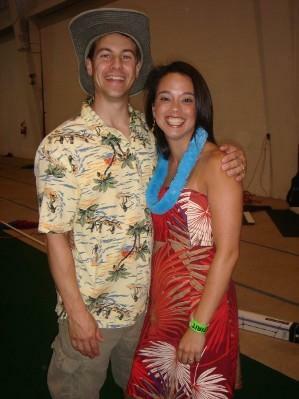 Corey and Nami Stone at a luau during cheer camp. LoveToKnow was excited to conduct an interview with KU cheerleader coach, Corey Stone. 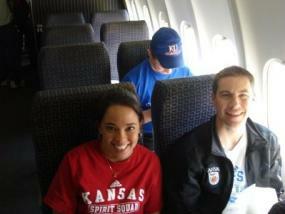 Mr. Stone and his wife, Nami, coach cheerleaders at Kansas University. Both Corey and Nami once cheered for the team they now coach. LTK: Tell us a little about yourself and how you got involved in coaching a university cheer squad. Corey Stone (CS): I was a gymnast in high school in Stillwater, Oklahoma, and a couple other guys and I did some cheer-related activities at games (the school wouldn't let guys join the cheer squad). For some reason it didn't really occur to me to try to cheer in college until I was at a basketball game at KU my freshman year. I saw the male KU cheerleaders tumbling and thought "I can do that!" So I tried out and made the JV squad my sophomore year, and then cheered three more years at KU. After graduating KU with a design degree, Nami and I got married and moved to Iowa City (where I was raised) to attend grad school at Iowa -- Nami in Physical Therapy school and me in Biomechanics. I thought I was totally done with cheerleading (which my back was happy about! ), but we happened to meet Gregg Niemiec, the Iowa cheer coach while we were lifting weights at a gym. One thing led to another and we ended up assistant coaching for Gregg for five years, and Nami also coached a high school competition squad in Cedar Rapids. After having our son Christopher in 2003, we'd been considering moving back to Kansas to be closer to family. I heard the KU cheer job was open, so I emailed the coordinator and set up an interview. LTK: KU is your alma mater. What does it feel like to be back at your home university? CS: Since I came to KU I've always been a huge KU fan, and I take a lot of pride in the cheer squad. My family and I have to sacrifice quite a bit to coach here, and being proud KU alumni is the main reason we do it. Lawrence is also a great town, so we're happy to be back. LTK: Your wife is your assistant coach. What is a day in the life of the Stone household like? Do you eat and breathe cheerleading? CS: Ha ha -- quite the opposite! KU considers the head cheer coach job a "1/3-time position", so they don't pay us much. I also work a full-time day job as a web site designer at KU and Nami works part time as a Physical Therapist, plus we have sons Christopher (5), Cooper (2), and new twins Eli and Emi! So every day in our household is pretty crazy, and I have to be very efficient with my cheer time to try to balance everything out. LTK: USA Today chose KU as a top 20 school for fostering student success. How does the cheer program focus on the importance of education? CS: Nami and I both got master's degrees, so we're big believers in education and stress that to the squad. One of our squad goals is that everyone graduates with at least a 3.0 GPA. As a policy, our cheerleaders are never required to miss any class time for cheer activities, and we do get some tutoring services from the athletic department. Our squad members are also eligible to be on the Athletic Department Honor Roll, and last year our spirit squad GPA was a 3.31. LTK: KU Cheerleaders get some financial support for their education. Can you tell our readers a little more about that program and how good grades really do pay off? CS: Currently, our cheerleaders receive a stipend of $325 per semester plus an additional $50 if their GPA was over 3.0. Our stipends have been increasing over the years and we're hoping that continues. LTK: About how many cheerleaders does KU have on squad at any one time?CS: Approximately 15 males and 15 females. LTK: It sounds like the coach to cheerleader ratio is pretty good. Can you tell us more about that? CS: Currently we have 16 cheer couples and three coaches who each bring something different. I handle recruiting, overall "program direction", crowd-leading, and help coach tumbling, baskets, and stunting. It turns out I'm too laid back to run efficient practices, but fortunately that's what my wife and assistant coach Nami excels at! I'm sorta the "big idea" guy and she's the one who can really get things done! She also coaches most of our routines including nationals (choreographed by Leighton Clarke), and coaches primarily Blue Squad pyramids and stunts. Our other assistant Jimmy Godfrey is a great tumbling coach who also works mainly with Red Squad pyramids, stunts, and baskets, in addition to helping with routines. LTK: Is the Rock Chalk dance team a separate entity, or do you work with those members as well? Do the cheerleaders and dancers ever perform at the same events? Also, what is the Spirit Squad? CS: The KU "Spirit Squad" consists of the KU Cheerleaders (about 15 couples), the Rock Chalk Dancers (22 dancers), and the Mascots Big Jay (4 guys) and Baby Jay (4 girls). The dancers have their own coach (I don't know anything about dancing!) At every KU football and basketball game, there will be some cheerleaders, dancers, and mascots. We rarely perform routines together, but we do games together all the time. LTK: You have a Blue squad and a Red squad. Can you tell us a little more about each squad, and what the responsibilities for each entail? CS: Both squads are 7 or 8 couples and the Blue squad is generally our stronger stunting squad. The responsibilities change a bit each year, but this year everyone cheers home football games and is eligible to be selected to travel to away games. The Blue squad will cheer about 2/3 of the men's basketball games, and the Red squad will cheer about 1/3 of the men's basketball games and about 1/2 of the women's basketball games. Everyone will cheer one volleyball game. Corey and Nami Stone show their squad how to perform a stunt. 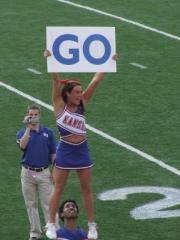 LTK: Any advice for a high school cheerleader thinking about trying out for KU cheerleading in the future? CS: Our tryouts pretty much come down to tumbling and co-ed stunting, so work on those! If you're considering trying out, make sure you go to our website's recruiting page and sign up for Email Updates from me so that you can stay posted on tryouts and any clinics we have. If you're interested in cheering at KU, please check out our web site for videos, photos, and info. With highly ranked academics, great sports teams (we won the basketball national championship and Orange Bowl in 2008! ), a fun town, and a competitive family-oriented cheer squad, KU is a great place to cheer! In general, if you're considering trying out for a college squad, contact the coach as soon as possible to make sure you fully understand the tryout and selection process so that you can prepare for it. LTK: What are your future plans for the cheer program at KU? CS: We're starting our fifth year here, and the squad's nationals placing has improved each year. Last year (2007/2008) we had a bunch of seniors graduate, including some really good big guys. This year we have a young but talented squad, and next year with some good recruits and hardly anyone graduating, I think we'll really blow up. One thing I'm considering for next year is if our skill level is fairly even across the board, I may make Red and Blue squads just be an equal split and have them share cheer responsibilities evenly. This would remove a lot of drama, so hopefully people could focus more on improving themselves and their squad!